This handsome fellow is City the Kitty. As a magnificently polydactyl (many-toed) cat, he has a special abhorrence for declawing! 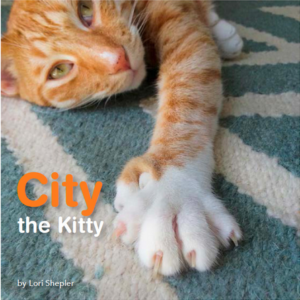 City–along with his mom, biographer, and photographer, Lori–works tirelessly to educate people and stop declawing. That’s not an easy job, with months-old twin babies at home to safeguard (not to mention, keep an eye on!). To help fund his efforts, City has published a beautiful book of photos that, for just $14.99, he will personally pawtograph for you! Please consider supporting this effort! Also, be sure to follow City so you can keep up to date with the movement to stop declawing permanently! City the Kitty is one of the most powerful advocates for cat welfare that I know. Please visit City at CitytheKitty.com, and get the book, poster or other fun stuff; and follow him on Facebook.